I usually favor a “less is more” approach for meat. I don’t really like to doll it up much. 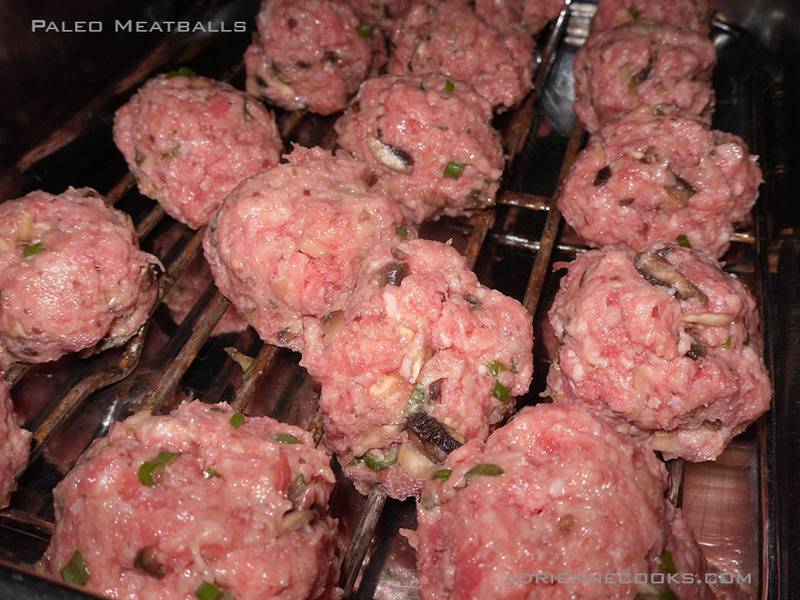 Here you’ll find my un-fooled-around-with meatballs. Pure paleo all the way. Why add filler like bread crumbs that don’t add flavor anyway? 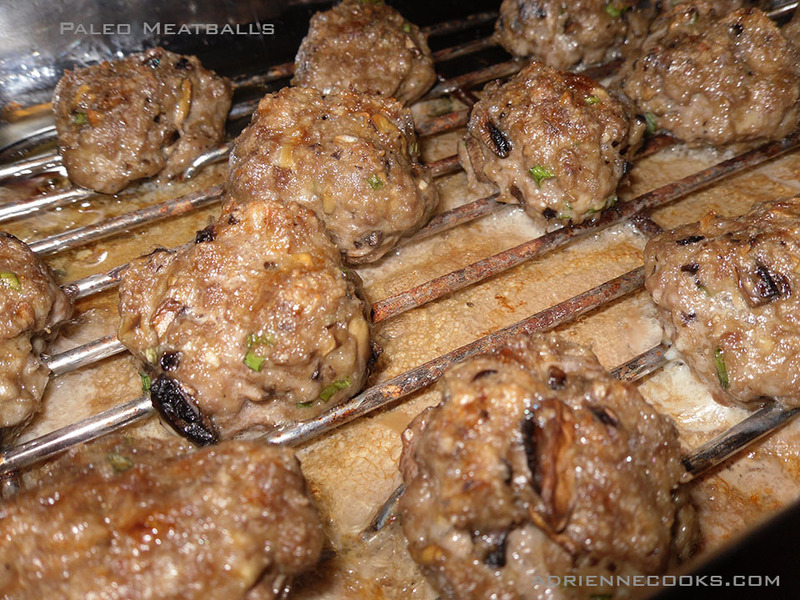 I spent years leaving them out of meatloaves and meatballs even pre paleo. They don’t really seem to “bind” very much… but that’s just my humble opinion. On this particular day I had mushrooms and green onions left over from other recipes (Mushroom soup and Beef Tips), so they are what I’ll include below. I also use bell peppers, zucchini, carrot and just about anything else I have lying around. Just make sure you’re only adding cooked veggies. Why? Because vegetables contain A LOT of moisture and any formed meat dish like meatballs or meatloaf will fall to pieces if your additions release all that extra water into the equation. I find the dashi broth adds a nice umami flavor. Dissolve 1 teaspoon dashi granules in 1 tablespoon of water. Precook your veg. Sweat the onion and mushroom in a sauté pan with olive oil until they release their liquid. You can add salt to speed this process but deduct that from what you add to your meat mix! Dump everything in a bowl and mix with your hands. 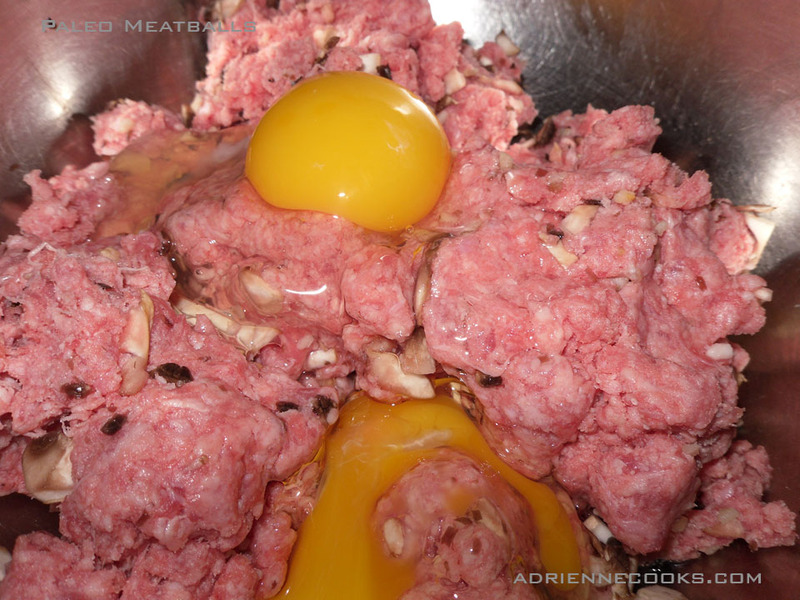 Form into 18-20 meatballs. Bake in a 350 degree oven on a rack over a sheet pan for 30 minutes. Serve with a tomato sauce if you eat nightshades. I combine one can of fire roasted diced tomatoes with 2 cloves of grated garlic, 1 whole avocado, and 1 tablespoon Italian seasoning. Makes the BEST rich sauce!